(and why you should avoid them). The old expression is true, "when you're on top, everybody wants to knock you off." UUC has been building the ultimate BMW shifter kits for many years now, right here in the USA. 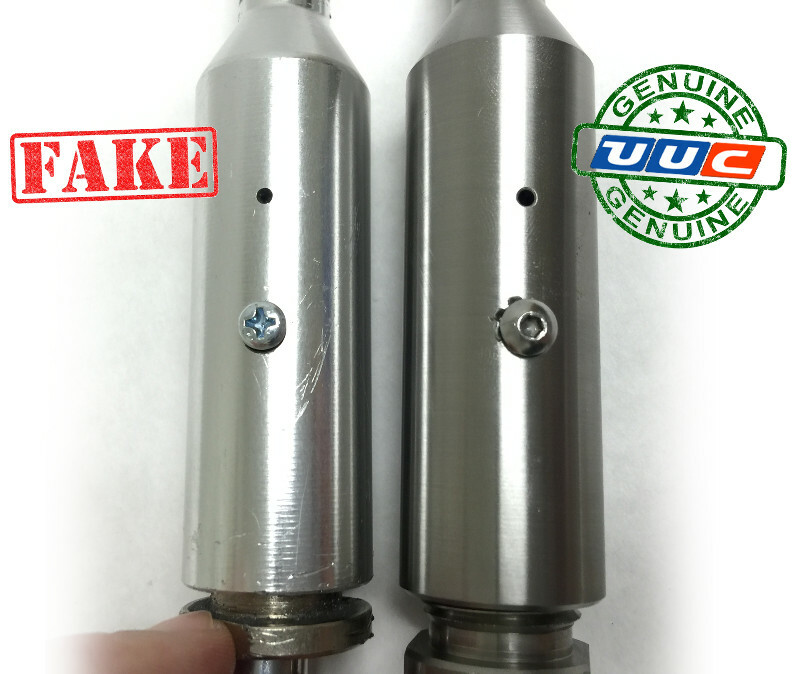 It seems that some kind of unscupulous overseas knock-off shop has copied a few of our designs but, as typical of these types of companies, using vastly inferior and cheap materials that absolutely do not deliver the same experience or hold up with the durability of a genuine UUC product. A customer called us up and said they were having trouble with the UUC shifter that came in their car when they bought it, it was feeling rough and wobbly. That's really a weird thing for us to hear as we build the UUC Evo3 shifter as a true "lifetime" product that should feel as smooth and precise no matter if it's 10 minutes or 10 years old. Our lifetime warranty on the Evo3 Ultimate Shifter applies to any UUC shifter, no matter if purchased by someone else or through one of our dealers. We asked him to send it in for analysis and a rebuild. What arrived was this item. Where to start? Everything is wrong with this knock-off. Using cheap bearings is a big problem. The lower pivot is a high-stress point and is exposed to everything under the car. 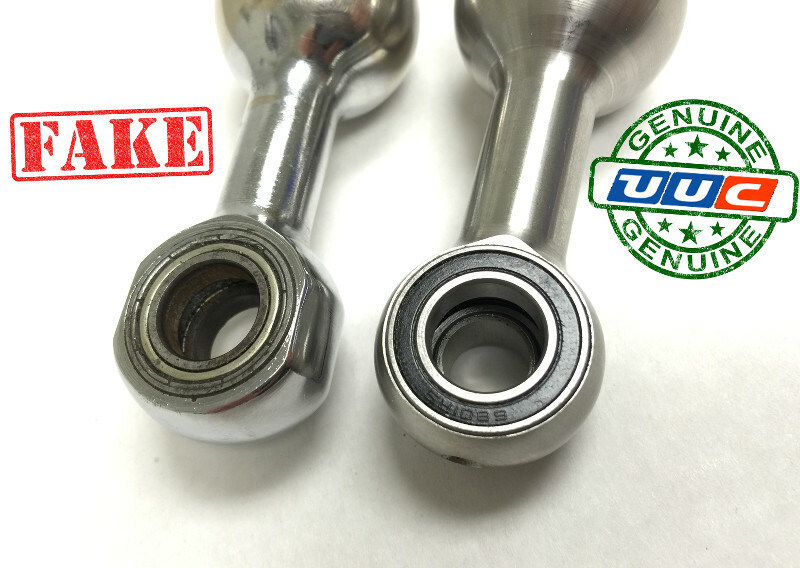 UUC shifters use a very expensive sealed bearing designed for automotive use. 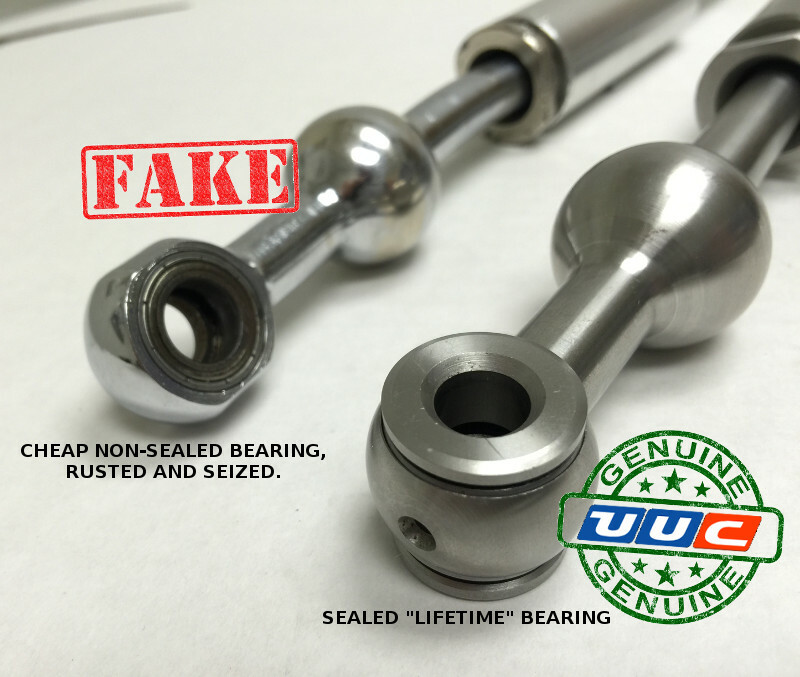 The fake has a bushing better suited for toys... it was already seized and would not rotate, or would "clunk-clunk-clunk" if forced to rotate. UUC shifters use a full-length silicone isolator bushing and even another one for the height adjustment guide bolt. Whatever marshmallow material was in the fake had disintegrated entirely, allowing the upper section to flop around. 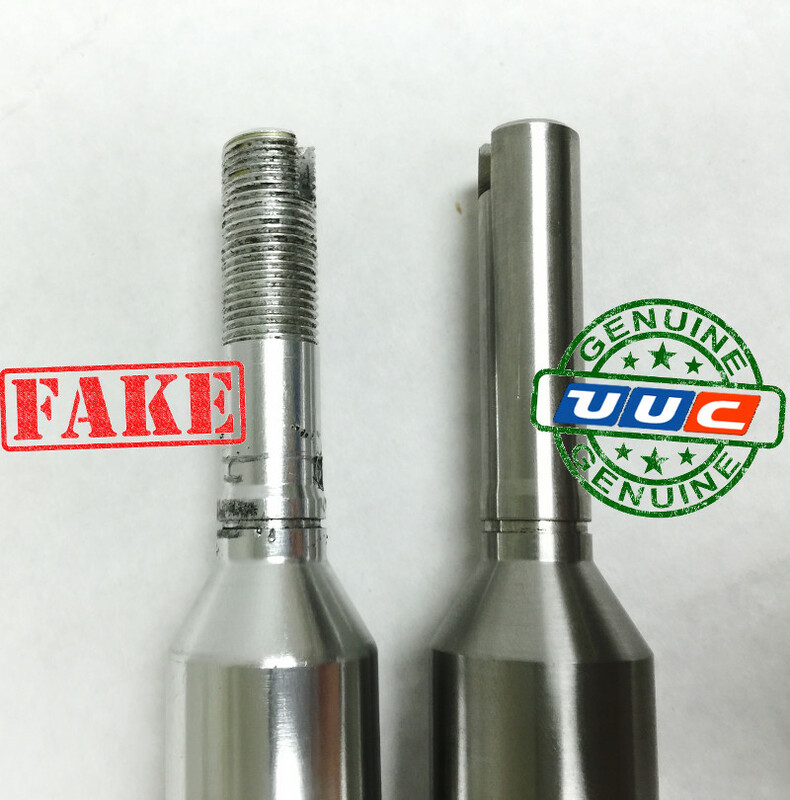 The upper section of the fake is a "universal" design, perfect for fitting your favorite Honda or Pep Boys shift knob. It's also soft aluminum, so whatever knob had been installed was already chewing through the material. Little details; the locking bolt on the fake is a cheap plated steel, standard Philips head. 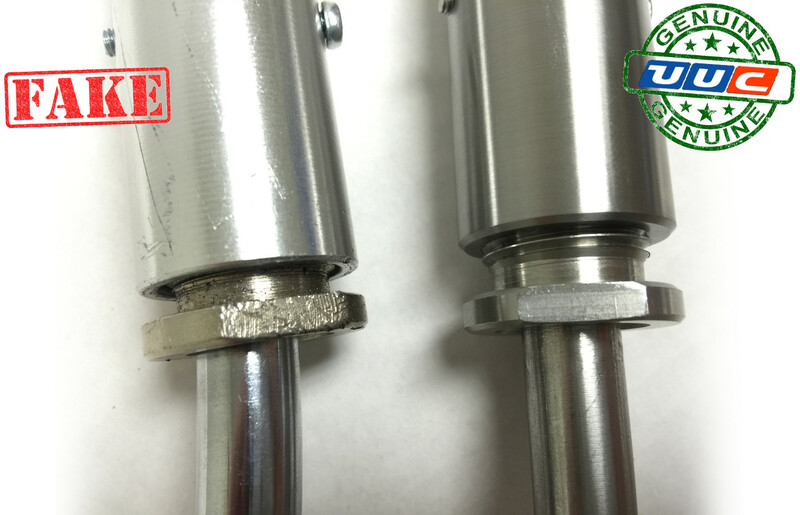 The UUC is a locking stainless steel and isolated bolt with an anti-tamper design as there is no reason for the user to ever remove it. More close-up details. 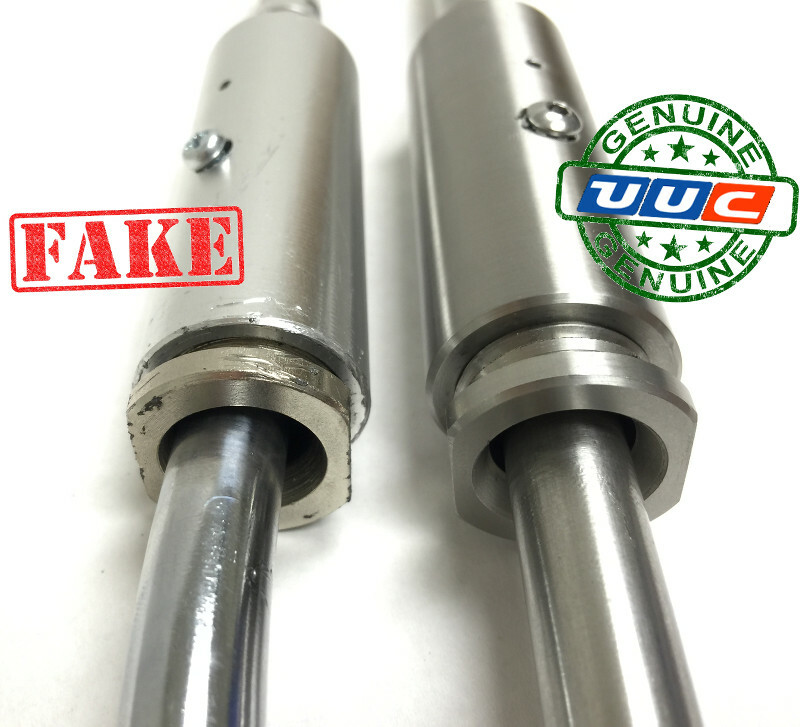 Look at the roughness of the machining on the fake versus the UUC. That says a lot about quality control. Another view of the bearings. The fake has no seal and is already rusting inside. The UUC is fully sealed and is stainless steel. Is it so hard to machine a perfect ball? This fake has an oblong pivot ball, which means shifter effort increased with shifter travel. The UUC is a perfect sphere, smooth and same effort all the way through the shifter. 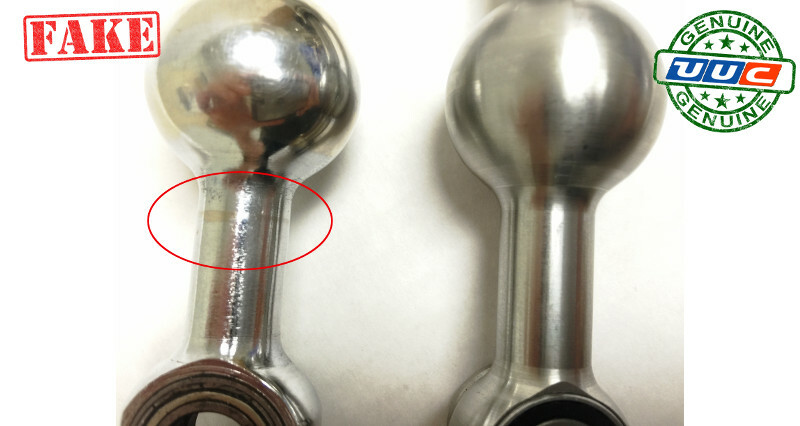 Whether the circled areas is a plating error or wear point, the plating is so thin that it's temporary. This fake is going to be a rusty shifter after a salty-road winter. 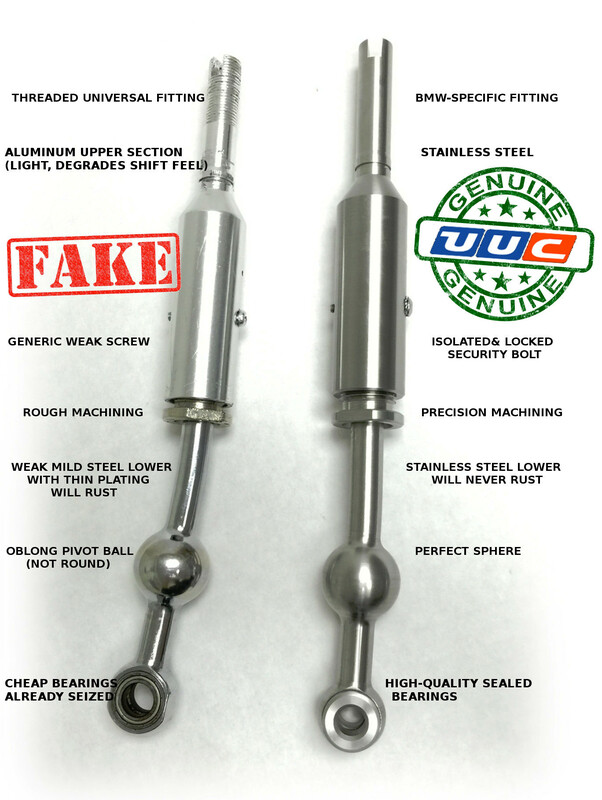 The UUC is, as always, 100% stainless steel and will never rust.